My boyfriend and I hosted a New Year’s Eve party at our new home in Austin this past year… tons of fun, but a little crazy since we returned from holiday travels the night before… I wanted to do a cake for the event, but didn’t have much time - the result is this two-tier fondant cake. 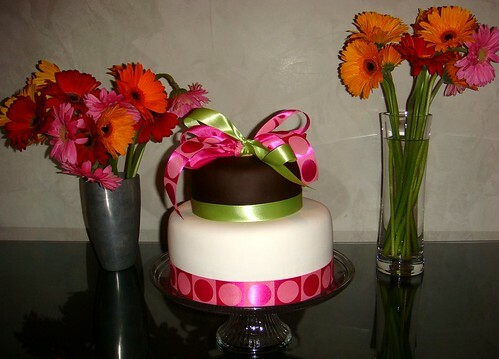 The bottom tier is chocolate with coconut cream cheese filling, iced in vanilla fondant. The top tier is chocolate cake with peanut butter filling, iced in chocolate fondant. I decided to do real ribbon given the short timeframe. Whew!